I have received information about #HowWeFamily from the makers of TYLENOL®. The opinions stated are my own. This is a sponsored post. For the second year, TYLENOL® has invited SAVVY AUNTIE to participate in its wonderful modern family-embracing campaign: #HowWeFamily. TYLENOL believes that "family" is not about who you love, but how you love. TYLENOL celebrates the diverse people and relationships that make up today’s modern families and is committed to sharing how modern families love. 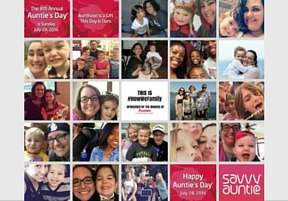 The makers of TYLENOL have embraced SAVVY AUNTIE because aunts actively participate in the lives of our nieces and nephews by relation - and/or our friends' children - the family we choose. SAVVY AUNTIE brand is designed to give aunts the resources and community they need to become savvier aunts, as well as to put a spotlight on the generosity of aunthood. There is no obligation to "aunt" of course. We do it out of love. We do it because we're family. It's takes a family-village and aunthood is #HowWeFamily. I am proud to be part of TYLENOL's #HowWeFamily campaign and thank TYLENOL for helping us celebrate the 8th Annual Auntie's Day on Sunday, July 24, 2016!. Savvy Aunties were asked to submit photos of themselves with a niece or nephew for the TYLENOL #HowWeFamily campaign. Here is the result! And even more Savvy Aunties added THEIR photos in the comments section on Facebook where it was originally posted. Feel free to add your photo, too! Please learn more about TYLENOL and #HowWeFamily at HowWeFamily.com.